Finally finishing up the rest of our trip over East! We took the 10 hour trip from New York to Niagara, nice enough scenery but probably would have been better flying to Toronto. Trains make me so, SO sleepy. A 10 hour trip during the day had me sleeping around 70% of the time. Of course by the time we made it to Niagara I was EXHAUSTED!! The time of year that we visited was nice because it wasn't crowded at all, and also wasn't too cold. However, because Niagara Falls is actually a huge hydro electric dam they turn the flow down during the winter months. The Niagara Falls Power Company is required to maintain a minimum flow going over the falls, during summer days it's around 2,800m3 and during winter and at night time it's 1,400m3. So this meant we technically only saw the falls at half speed, but that's still a lot of water! Niagara Falls is a little bit like a small Vegas - casinos and tourist shops. We only spent one night there, but I think if you go for a few days it's worth while getting out of town and visiting the lakes and vineyard areas. A prime example of the discrepancy between Canada and the USA. On the US side 1/4 price to use the binoculars! O'Hara is in LOVE with Toronto. I think it's because we went all out with respect to food for the short time we were there. 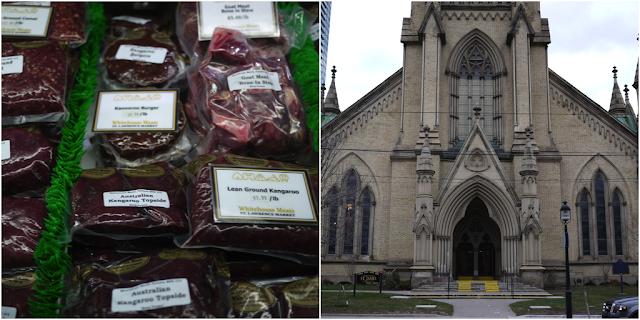 Toronto doesn't seem as hectic as other big cities nearby, but it has an awesome amount of diversity which means the variety of food is amazing. We also saw some fabulous design stores, which made us pretty happy. I can't wait to find a house we plan to live in for a long time and stock it with cool stuff. We'll have to go back to Toronto. 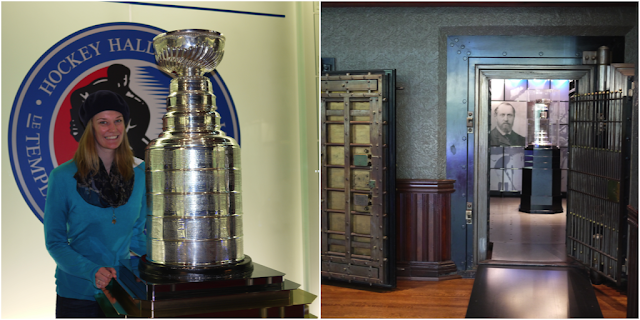 We checked out the Hockey Hall of Fame while there, and got to touch the Stanley Cup (NHL winners cup)!! Pretty cool, O'Hara is really disappointed with himself that he didn't lick it though. The Hockey Hall of Fame room was designed to be a bank. Canada decided that as hockey was going to be an integral part of it's culture, they would instead turn the building into a memorial hall of cups and best players. Only in Canada! My little brother has just moved to Fredericton to do a semester of uni and be with his girlfriend (also Emily, great name). Fredericton is the capital of New Brunswick but it's a reasonably small town with about 30,000 people. Fredericton has a lot of French and English heritage which has lead to some beautiful downtown areas and architecture. The day we arrived there was a huge snowstorm which meant we had to circle the plane for an hour before landing, and also meant it was picture perfect when we got there. On our first night O'Hara was convinced he should eat the Epic Burger at a local pub. 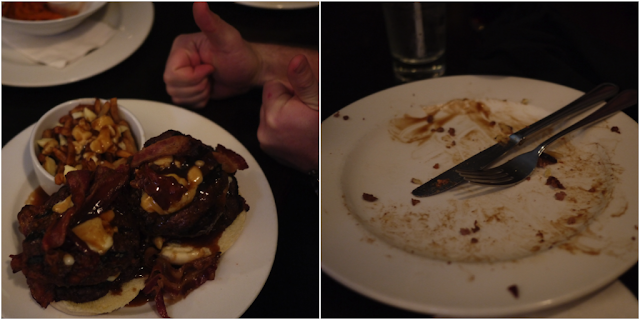 This consisted of 2 pounds of beef, cheese curds, bacon, bacon, bacon and gravy. He ate it ALL! Epic effort alright. He didn't feel 100% that night, but lived through the ordeal without having a heart attack. 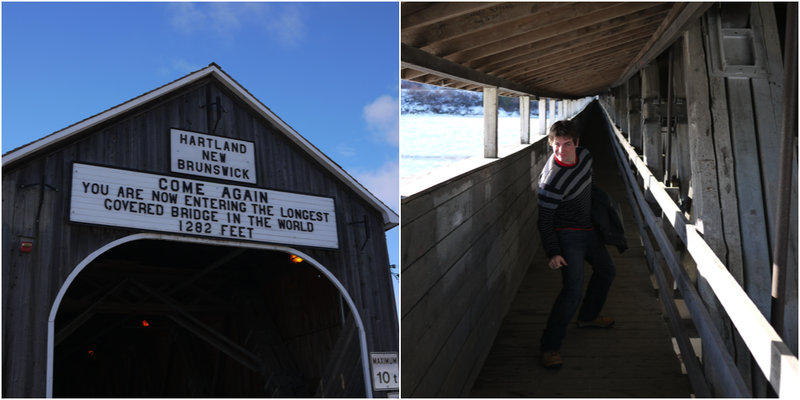 The next day we went for a road trip out to the worlds longest covered bridge! Yep, it's a real thing in Hartland, New Brunswick. Epic burger. Now you see it, now you don't! GF Emily's family were kind enough to include us in decorating the Christmas Tree, which was a nice feeling as we didn't have a chance to get one in Kamloops. 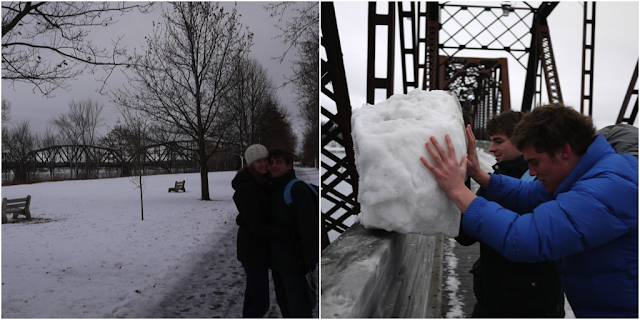 The day after, we spent with Jonathan exploring the scenic areas of Fredericton on foot. I finally found someone who slips on the ice more than me! Finally, and it's a good feeling. 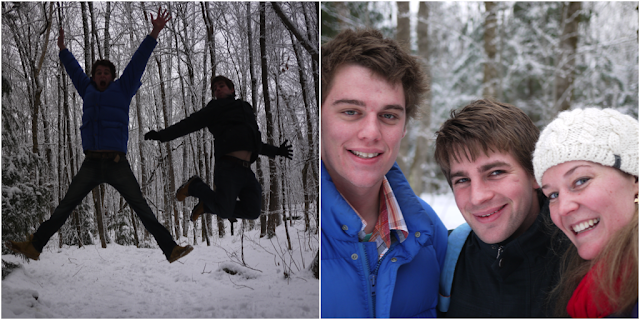 Walking the the park with all the snow. So beautiful! On our last day we went to the Farmers markets (they run all through winter which is awesome). There was a lot of local arts and crafts as well as food which was cool. I'm sad I didn't buy a pair of moose leather moccasins. I think I'll get Jonathan to pick me up a pair! For dinner we went to Kings Landing, which is a historic settlement just out of Fredericton. The government was building a dam back in the day that would have flooded all the houses, so they picked them up and moved them! It's now an outdoor living museum. We had a traditional Christmas dinner that was wonderful and delicious. 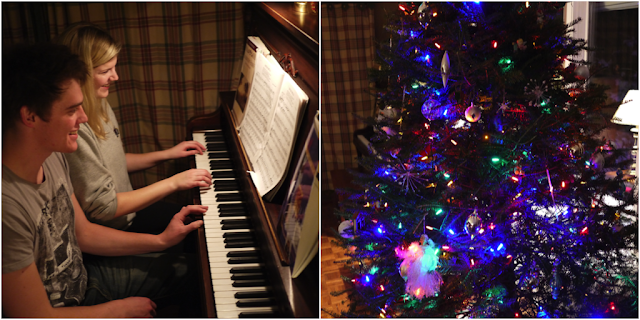 People came and sung us carols and made Jonathan (the only one not drinking) dance. Awesome! 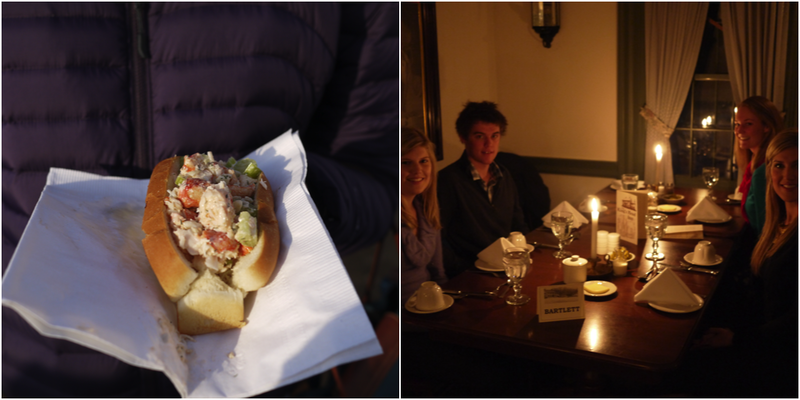 Breakfast lobster roll at the markets, and Kings Landing dinner! What's better than a Winter Wine Festival?